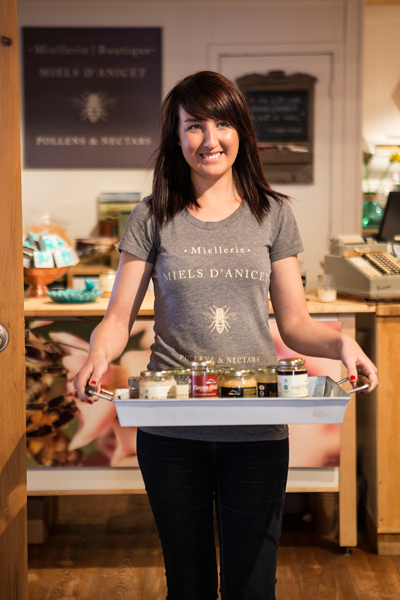 The working class of Miels d’Anicet | Young, dynamic and smiling, our team is an integral part of who we are, beekeepers who love their job, who love life, people and certainly bees. With her skillful hands, Lydiane masters the art of emulsifying honey, wax and propolis to create the Melia product line. Trained as a beautician, she is also present in the boutique to find the ideal product for your skin. Biologist, Rosalie masters the art of quality control. She collaborates with the best suppliers and ensures the cohesion of the production and teamwork. Bénito, our woodsman, is also a great beekeeper when beekeeping season begins. The many bee stings that stays with him throughout the seasons show his exemplary perseverance and his deep-seated passion. Suzie, the dean of the team, keeps the records and balance of the accounts, but also the thousands of queen bees who are raised on the farm. Flexibility, dedication and rigor at work, that’s what characterizes her presence at Miels d’Anicet. Beekeeper of an incredible physical strength, he is the man with thousands of assets. Ask him to repair the truck or to find the queen in the brood chamber, he shows up all the time! The man behind the kitchen at Pollens & Nectars canteen, he sets up a menu that values the taste of honey, the freshness of seasonal vegetables and local products. Mélissa, in charge of our online boutique orders, carefully prepares each package so that they travel without harms to your door. Do not hesitate to contact her, she is charming!